Balmy summer days are the perfect excuse not to cook. When you need to beat the heat but still want a nutritious snack, simple dishes with fresh ingredients are the perfect solution. 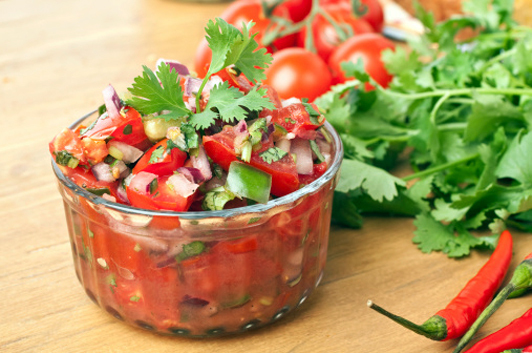 Nothing says refreshing better than crisp juicy tomato, savory cilantro and sharp onion. Finely chop the onion, dice the tomatoes and mince the garlic. To finely chop the cilantro, tightly roll the bunch and rotate the roll as you cut. Add all ingredients in a bowl. In a separate bowl, whisk the apple cider vinegar, lime juice and chili powder and add to the salsa. Toss to coat thoroughly.